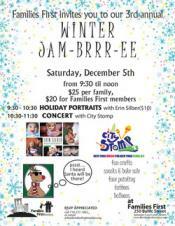 Families First invites you to their annual Winter Jam-brrr-ee featuring a concert with City Stomp. The day will also feature fun crafts, snacks, face painting, tattoos, balloons and more. There will also be holiday portraits with Erin Silber ($10). And Santa himself will be at this bash! The event takes place at families First on Saturday from 9:30AM to 12:00PM. The cost is $25 per family. RSVP is required. The Little Orchestra Society presents live music in ways that inspire and educate audiences of all ages while creating a new model for the 21st century orchestra that emphasizes connections with the community. 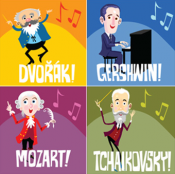 This weekend learn all about the composer Dvorak. The concert is taking place at The Kaye Playhouse at Hunter College on Saturday at 10:00AM and 11:30AM and on Sunday at 11:30AM and 1:00PM. Tickets start at $15. It’s Mardi Gras in Manhattan! Influenced by the music from her mother’s hometown of New Orleans, as well as by her father’s Trinidadian culture, Jazzy Ash and the Leaping Lizards bring children along on a swingin’ musical tour of New Orleans. With this full six-piece band, and upbeat catchy music styles of jazz and zydeco, you’re going to have a grand ol’ time on this music journey. Taking place on Saturday at the David Rubenstein Atrium at 11:00AM. This concert is free to enjoy. New York Theatre Ballet will be performing Keith Michael's The Nutcracker for free at Brookfield Place! This one-hour version of the beloved holiday ballet performed to Tchaikovsky's cherished score is set Art Nouveau-style circa 1907 with innovation choreography by long-time NYTB choreographer, Keith Michael. This show is perfect for ages 3 and up. Taking place on Saturday at 1:00PM and 7:00PM. 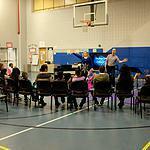 Metropolitan Opera Guild: Opera in your Neighborhood! Join the Metropolitan Opera Guild and the Metropolitan Opera as they explore the magical world of opera! You will explore the parts of opera – singing, characters, costumes, music and words and create your own mini-opera about the neighborhood! It promises to be an afternoon that will delight both parents and children and no musical experience is necessary! Taking place at Jamaica Performing Arts Center on Saturday from 2:00PM to 4:00PM. This event is free but an RSVP is required to attend. 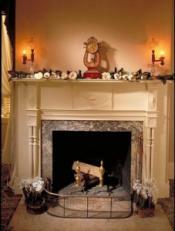 Step into the holiday season of 1830, take a tour by the warm glow of candlelight, enjoy historic caroling, and sample traditional confections and beverages. Listen to the PACC Recorder Consort perform holiday and period music. Taking place on Saturday at The Mount Vernon Hotel Museum & Garden at 6:15PM and 7:30PM. Reservations are recommended. Admission is $20 for adults, $10 for members and $5 for children under 12. 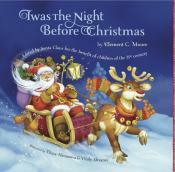 Hear the traditional story Twas the Night Before Christmas followed by a visit from Santa Claus. Bring kids in pajamas and a camera! Also, enjoy seeing the museum decked out in its holiday finest. Taking place on Saturday at the Van Cortlandt House Museum at 6:00PM, 6:45PM and 7:00PM. Reservations are required. Chanukah Festival: Light Up Your Life! Bring the whole family to celebrate Chanukah at the 92nd Street Y's fun-filled festival! From dreidel, Menorah and holiday card making to special activities and games, this festival event is not to be missed. Please bring an unwrapped, unopened gift for the Chanukah gift drive. The festival is taking place at the 92nd Street Y on Sunday at 11:00AM. The cost is $18 for children and $12 for adults. Dan Zanes and Friends perform exuberant, handmade 21st Century social music for enthusiastic crowds of kids and kid sympathizers. These Grammy Award winners occupy a unique place in American music where sea shanties, English music hall, North American and West Indian folk music, Mexican son jarocho, the spirit of early rock-and-roll and soulful originals collide. It is an old-fashioned interactive experience where people of all-ages sing and dance with wild abandon to the sound of drums, upright bass, mandolin, electric guitar, trumpet, fiddle and spoons. It’s a big musical party and everyone’s invited. The show is taking place at City Winery (aka The Barrel Room) on Sunday from 11:00AM to 1:00PM. The cost is $20 per ticket. On Sunday, at 11:30AM sharp, an FDNY Ladder will rescue Santa from the roof of the Museum! Afterwards he will take gift requests and pose for photos until 2:00PM. It is free to view the rescue outside. A paid admission ticket allows you to sit with Santa inside the Museum.This classic holiday event takes place at the New York Fire Museum on Sunday at 11:00AM. Tickets to sit with Santa costs $8 for adults and $5 for children ages 3-12. The Jewish Museum is hosting a Hanukkah Family Day. Activities include, designing a menorah sculpture with found objects, painting fabric designs for the holiday, collaboration on a large abstract light collage, dreidel decorating, a live performance by storyteller and illustrator Jeff Hopkins using live drawing, animation, and narration with sound and movement. There will also be a special book signing and reading with Amanda Peet and Andrea Troyer from their book: Dear Santa, Love Rachel Rosenstein. And rounding out the day is a ShirLaLa Hanukkah Concert at 2:30PM by kid rocker Shira Kline. The event takes place on Sunday from 12:00PM to 4:00PM. All events are free with museum admission. Head to the VanderEnde-Onderdonk House in Queens to visit with St. Nicholas and learn the legend, enjoy holiday treats and sweets, listen to traditional music, and there will also be crafts for children, the tree lighting takes place at 3:00PM. The event is taking place on Sunday from 12:00PM to 4:00PM. Adults cost $5, children are free. Explore New York City’s oldest house and learn how the Dutch tradition of Sinterklaas evolved into the American tradition of Santa Claus with traditional music, treats, stories, and crafts. This event is taking place at the Wyckoff Farmhouse Museum in Brooklyn on Sunday from 1:00PM to 4:00PM. The cost is $5 for adults, $3 for children under 10 and free for kids 2 and under. Celebrate the season with Morgan’s unique manuscript of Charles Dickens’s A Christmas Carol. Dickens, Scrooge, Cratchit, and the Ghosts of Christmas Present and Past will join forces with strolling musicians, magicians, and all-around street fair entertainers to sweep families into a whirlwind of exuberant fun! Come join this merry bunch and enjoy a puppet show, a creative craft workshop and our one-of-a kind collection of literary costumes for children to model. Taking place on Sunday at The Morgan Library & Museum from 2:00PM to 5:00PM. All activities are free with museum admission. On Sunday evening, gather around the 32-foot-high, gold-colored, 4,000-pound steel holiday icon at Grand Army Plaza (Fifth Avenue and West 59th Street, across the street from The Plaza hotel) to kick off the annual Jewish Festival of Lights. Lightings generally take place at 5:30PM. This event is free to enjoy. 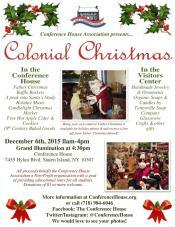 Enjoy a colonial Christmas at the Conference House in Staten Island this Sunday. Taking place in the Conference House is Father Christmas, raffle baskets, a peek into Santa's study, holiday music, a Candlelight Christmas Market, free hot apple cider and cookies and 18th century baked goods. Taking place in the Visitor's Center is a market filled with handmade jewelry and ornaments, organic soaps and candles by Tottenville Soap Company, glassware, crafts and other gifts. Don't forget to bring your own camera! Father Christmas is available for holiday photos and receive a free gift from Father Christmas himself. The colonial Christmas event takes place on Sunday from 11:00AM to 5:00PM. The grand illumination takes place at 4:30PM. Donations of $3 or more are welcome.